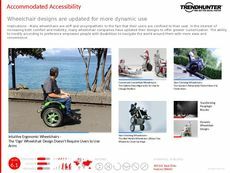 Find Better Ideas, Faster ® with a custom seating solution trend report, our PRO Dashboard and 80+ categories of premium trend reports. The Seating Solution Trend Report includes cutting edge designs for office chairs, couches and benches. 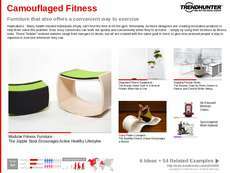 Among the various examples are fitness chairs that incorporate ellipticals and bikes into work desk designs. We also look at unique materials, like seating made of elastic fabric to provide fun and comfortable alternatives. Finally, ergonomic seats that enhance health and back support are gaining popularity at home and in the office, with moving components to enhance mobility. 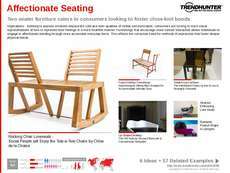 Furniture designers will find this report especially useful in creating novel designs that solve existing consumer problems or complaints, like those of comfort. Health professionals, fitness device developers and designers interested in ergonomics will all find many applicable solutions within. 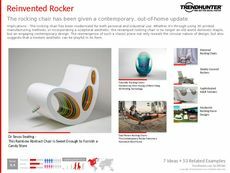 The Seating Solution Trend Report compiles data on furniture designs that innovate traditional chairs to provide improved comfort, entertainment or design aesthetics.